Tymon Mellor: On the 20th October, 1905 the Governor, Sir Matthew Nathan wrote to the Colonial Office in London confirming that the route to be adopted for the Kowloon Canton Railway (British Section) would follow the eastern alignment via Shatin, rather than the western alignment via Tuen Mun, and which would have eight stations within the Territory. Now all they had to do was to build it. Over the following few months, the designer optimised the route and prepared drawings for the initial construction works. On the 9th December, 1905 work commenced on the railway embankment by the Public Works Department north of Tai Po, and five months later in May, 1906 preliminary work commenced on Beacon Hill Tunnel. 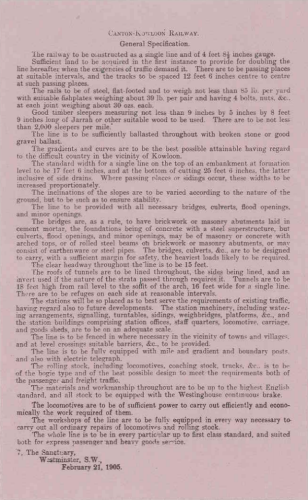 In April, 1905 Sir John Wolfe Barry and Partners were appointed by the British Government to provide technical guidance on the route selection, develop the necessary drawings and provide support during construction. Sir John Wolfe Barry appointed Mr Graves William Eves to lead the works as the Chief Resident Engineer. Mr Eves was an experienced railway engineer and had recently been working in Shanghai. He was the man to turn the design into reality. The management of the railway construction would be undertaken by the Hong Kong Colonial Government, using internal resources or ‘departmentally’ rather than letting contracts. The former approach would allow the works to start immediately without the need for the tendering of contracts. There was a shortage of experienced contractors to take on such a large project in Hong Kong so no one objected to this arrangement. Thus, as soon as the design was ready, construction would commence on site. 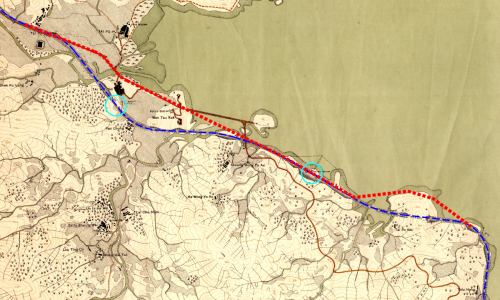 An outline specification for the railway had been prepared in February, 1905 for negotiations with China. This established the basic principles of the line and provided the guidance necessary to complete the design of the railway. The specification established a number of key criterion, notably the rail gauge (or spacing between rails) of 4 ft 8½in, compatible with the rest of the Chinese railway network. The specification also called for the railway to be designed for future double tracking, requiring additional land and wider structures. 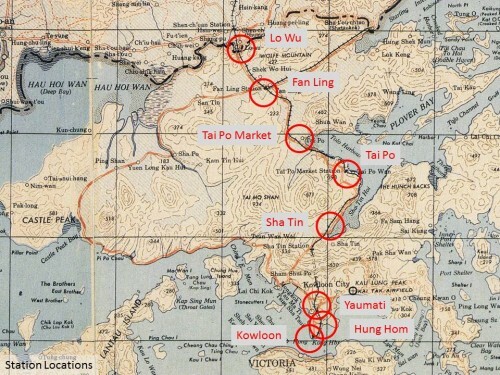 revision of the alignment at Tai Po, moving it inland and providing a new tunnel Tai Po Tunnel (tunnel number 5) to avoid passing around a small hill. The figure below shows the original alignment in red and the revised alignment in blue, with the stations highlighted with circles. 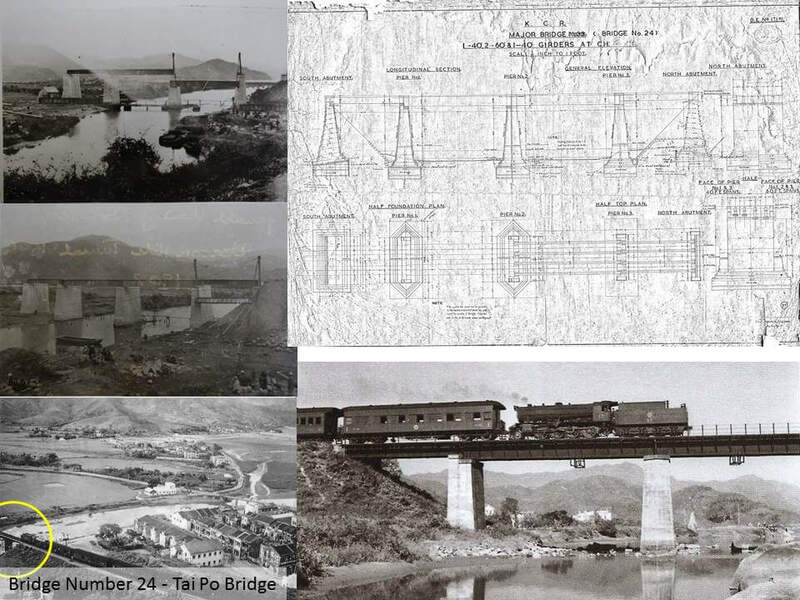 A few months prior to the changes on the 9th December, 1905 on the direction of the Governor, the Public Works Department had commenced construction of the alignment between Tai Po and Lo Wu Ferry based on the original alignment. With the review of the alignment, and concern about cost, Mr Eves suspended the works at the end of April, 1906. By that time over 4,100m of embankment had been completed with a further 914m under construction and 274m of double line cutting completed. Much of this was now on the abandoned alignment. The completed embankment works were used as temporary roads, and those now on the abandoned alignment were later incorporated into the future Tai Po – Fanling Road. 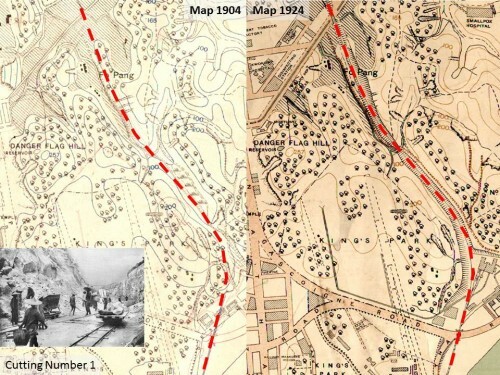 The final railway alignment was 35,808m long, included five tunnels ranging from 45m to 2,198m in length, 48 bridges, 66 culverts, requiring the movement of 2.6 million m3 of spoil associated with cuttings and embankments. Construction of the line was recognised as one of the outstanding engineering achievements of the era when it opened on the 1st October, 1910. Starting at the southern end of the line, a temporary terminus was established close to the Star Ferry. 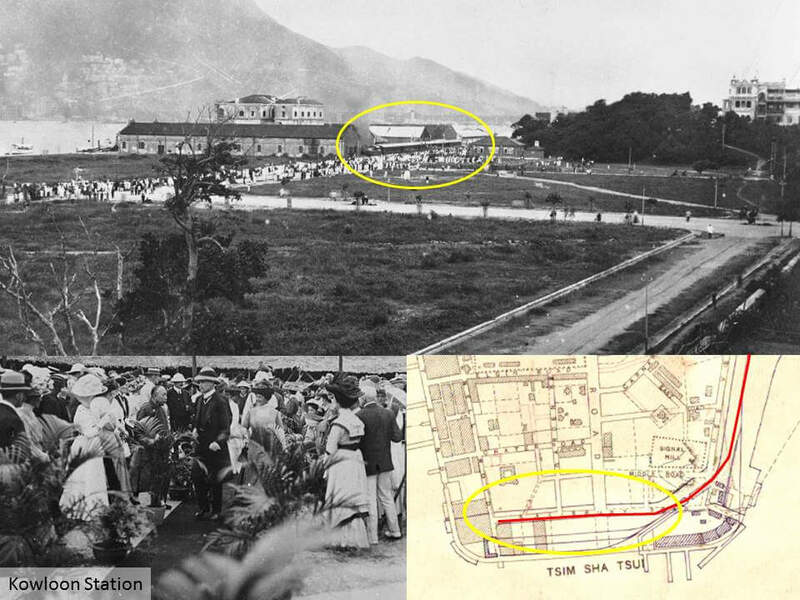 The location of Kowloon Station could not be agreed until late in to the construction programme, and was not completed until 1916, nearly six years after the railway opening. More details will be described in the next article. 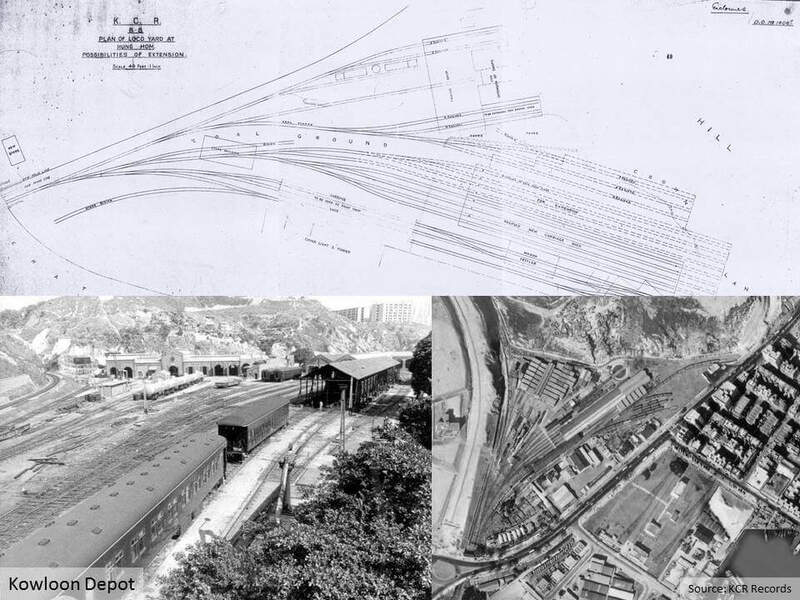 A temporary Kowloon Station was established for the opening day, consisting of rented accommodation in the adjacent godown belonging to the Hong Kong & Kowloon Wharf & Godown Company and mat sheds. 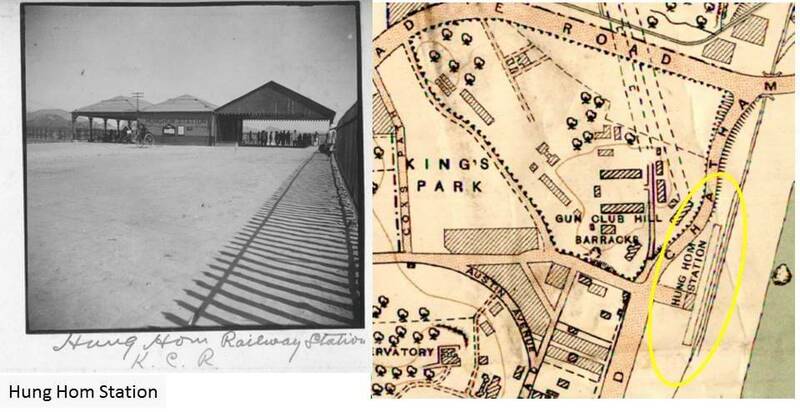 Temporary railway tracks were laid along the land reserved for Salisbury Road. 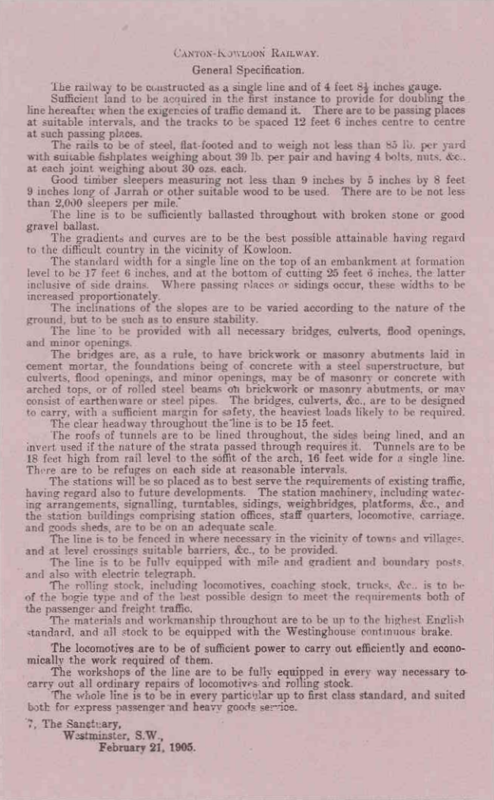 A wooden structure was erected for the railway opening, and as recorded in the 1910 annual report, “serve well enough until such time as events necessitate the building of a terminal station.”. The station was intended to link with a ferry service to Hong Kong Island at some point in the future. 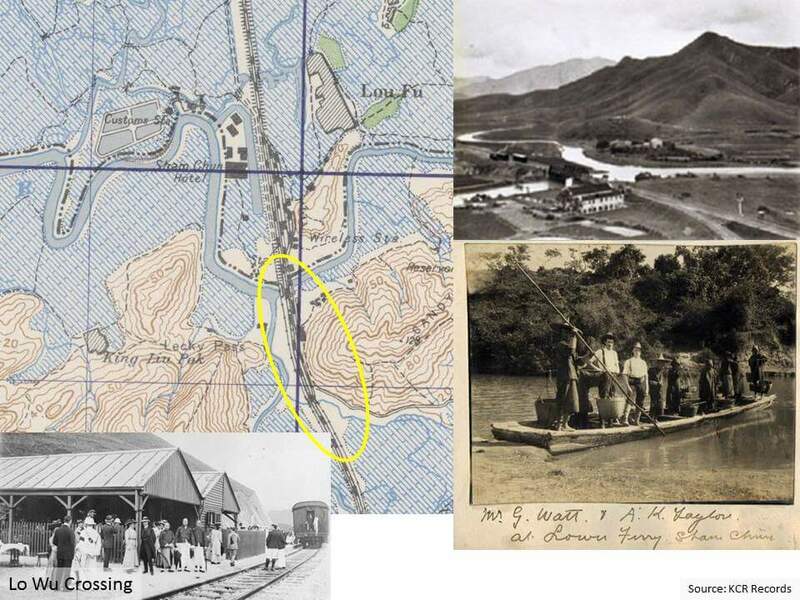 The station at Yaumati was on a tight curve and set on the side of a steep hillside. 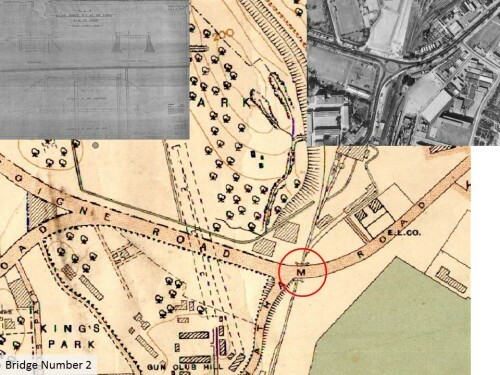 To the north, a short tunnel (Tunnel number 1) was constructed before the bridge crossed over what would become Prince Edward Road. 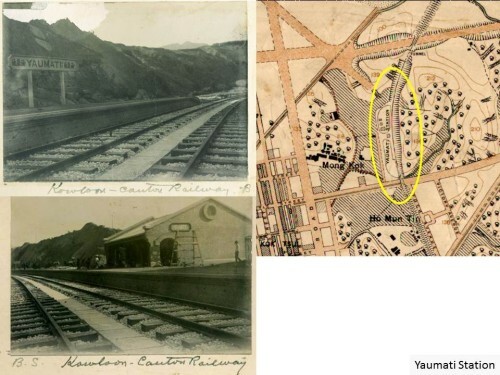 A small goods yard was later constructed to the north of the station and the station was later re-named to Mong Kok Station. 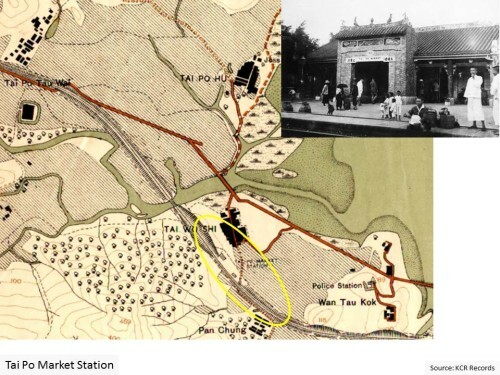 Sha Tin Station was located close to the “Frontier Road” or Tai Po Road and was located in a central position to serve the surrounding villages. It was one of the few stations to have a permanent building for the opening day. Tai Po Station, later to be re-named Tai Po Kau, was originally seen as a key station on the line, as recorded in the original alignment report in October 1905: “At Tai Po Station, a station ground of considerable width may ultimately be required, and facilities should be provided there for loading and discharging seaborne goods. I have therefore shown on the plan a jetty and landing stage, which would also afford some shelter for small craft in stress of weather. I am of the opinion that Tai Po Station would ultimately become the busiest way station on this route, certainly as regards first class passenger traffic, and express goods. In this attractive locality there are plenty of fine building sites on Crown land suitable for villa residence and bungalows, within easy reach of the station, which would undoubtedly bring forth their crop of houses in due season, were railway communications established with Kowloon. In addition to the considerable fish and general trade that may be expected from Mirs Bay, considerable business might also be expected to be done in carrying supplies to such of His Majesty’s ships of the China Squadron as might be anchored in Mirs Bay”. The area of reclamation was indicated on the maps of the time along with the jetty constructed, but the forecast growth and popularity never occurred and ultimately the station was closed as part of the double tracking works in the 1980’s. For the railway opening, Tai Po Market Station consisted of a temporary structure, but by 1913 a permanent structure based on a Chinese design was erected to much favorable comment from the travelling public. 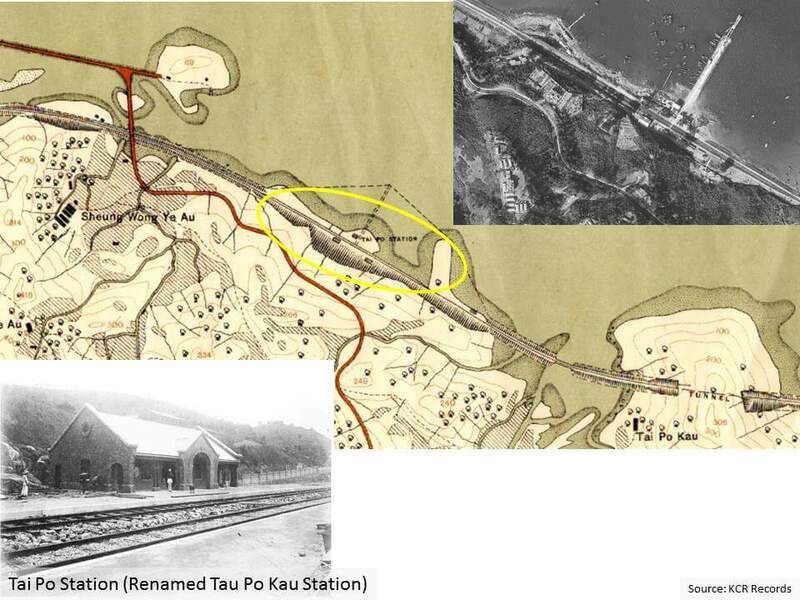 The structure can still be seen today in the Railway Museum at Tai Po. Fanling Station was to be where the railway line to Yuen Long would join the Kowloon Canton Railway, but the line was never constructed. 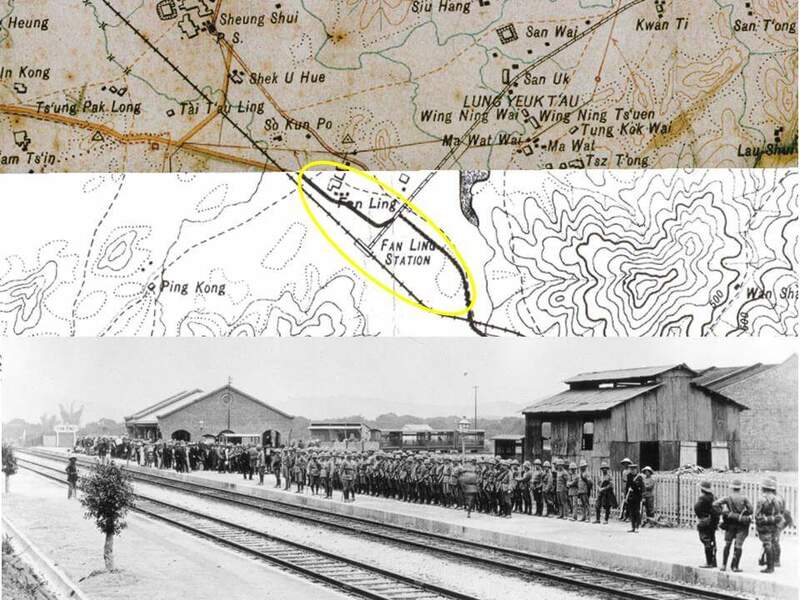 However, a two foot narrow gauge branch line was constructed to Sha Tau Kok, serving the villages and busy crossing into China. Construction of the line commenced in April, 1911 and was opened for traffic on the 21st December, 1911. 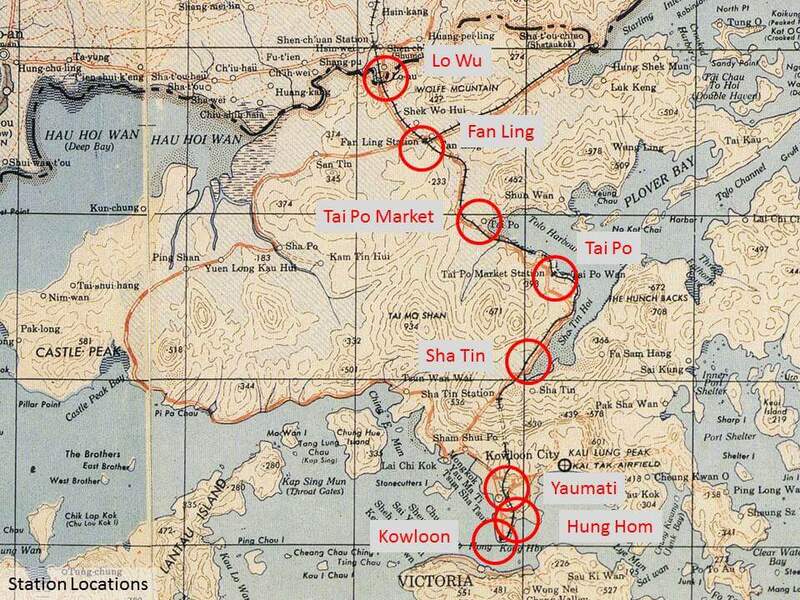 The British military established a number of bases in the Fanling area, with the station being the main means of access for troops. A temporary station and repair shop was constructed at Lo Wu to provide a terminus, until the Mainland section of the line was completed. The station was closed on the 5th October, 1911 when the Chinese Section of the line was open to through traffic. The station loop track was maintained for shunting and as a “Supplementary Station for Military purposes or emergencies”. 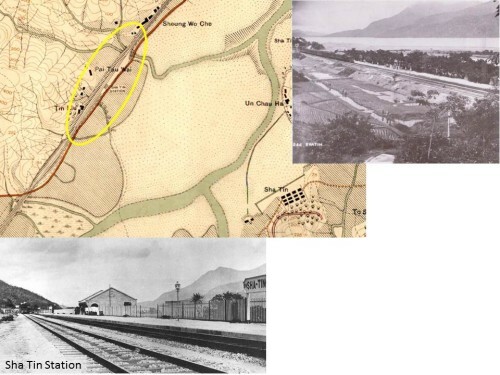 Railway maintenance facilities were required for the new line, and a site to the north of the Kowloon Docks at Ho Man Tin was identified as being suitable. The proximity of the docks simplified the marine delivery of rolling stock and provided a source of skilled workers with experience in engines and boilers. The site was to the north of the current Hung Hom station. Construction of the railway required the excavation of a total of 2.6 million m3 of material to form cuttings and embankments. The excavations were all undertaken using manual labour and simple equipment such a wheel barrows and carrying baskets. There were attempts to improve production with the use of steam cranes and locomotives, but the equipment either broke down or derailed. This became such a regular occurrence that it was concluded that the equipment was being put out of action to ensure the basket coolies could maintain employment. Koppel waggons (hand pushed steal tipping waggons) were used but found to be too heavy for one man to tip. They were not liked by the workers, who preferred baskets or wheel barrows. The latter were preferred by the foremen who could sit in the shade and listen to the squeaking of the wheels to know that the men were working. Excavation of the rock used blasting methods, with the larger boulders being broken down to 13kg for carrying away by coolies. Typically these workers could move around 4m3 per day with their baskets or barrows. The local workforce was experienced in making embankments from borrow pits but excavation of cuttings was a new construction form and required additional supervision. On the east side of Kowloon, a new reclamation was undertaken to create the space for a new station yard and approach to Kowloon Station. The reclamation of around 160,000m2 required the construction of 1,310m of sea wall and 900,000m3 of fill material, mostly supplied from cutting number 1. The seawall and reclamation works were undertaken by one of the few European contractors in town, a company called Leigh and Orange. 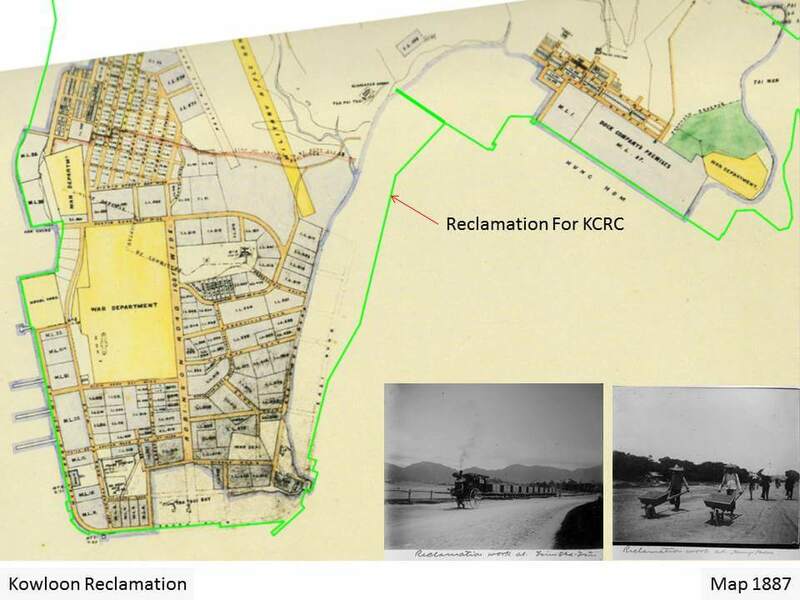 The progress of the reclamation was considered unsatisfactory with notable delays with the sea wall construction. North of Hung Hom Station, the railway entered a deep and long cutting requiring the excavation of around 850,000m3 of material. The cutting was over 50m deep, 1,200m long and at the time, there was considered to be only one deeper cutting in the world, the Culebra Cut on the Panama Canal. 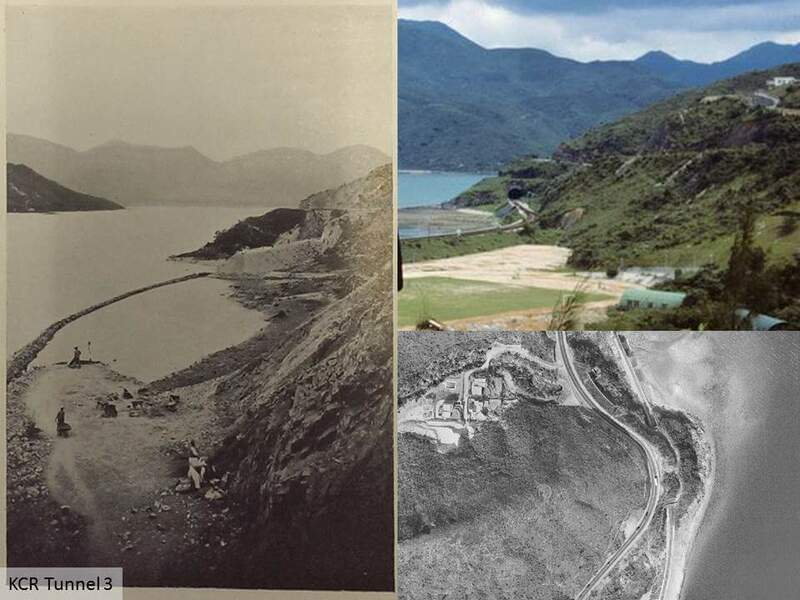 The spoil from the cutting was taken by narrow gauge railway to fill the new reclamation at Blackhead (now Tsim Sha Tsui). To the north of Yaumati Station, an embankment was constructed using the excavated material. However, settlement occurred along with the adjacent ground heaving, or as recorded in 1908, “causing the ground to spue up all around”. Additional material was placed to make up for the loss and equilibrium was achieved. 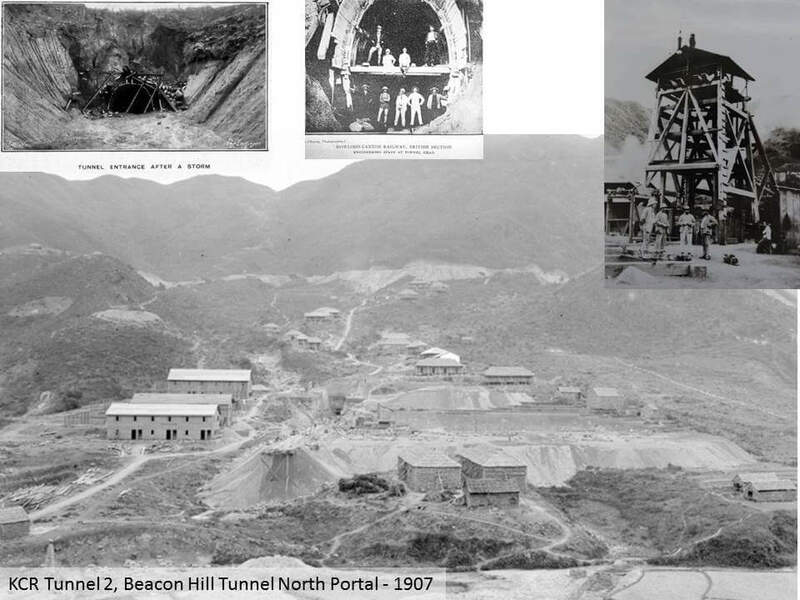 The alignment included five tunnels, the longest being the Beacon Hill Tunnel at 2,198m and the longest tunnel in China. 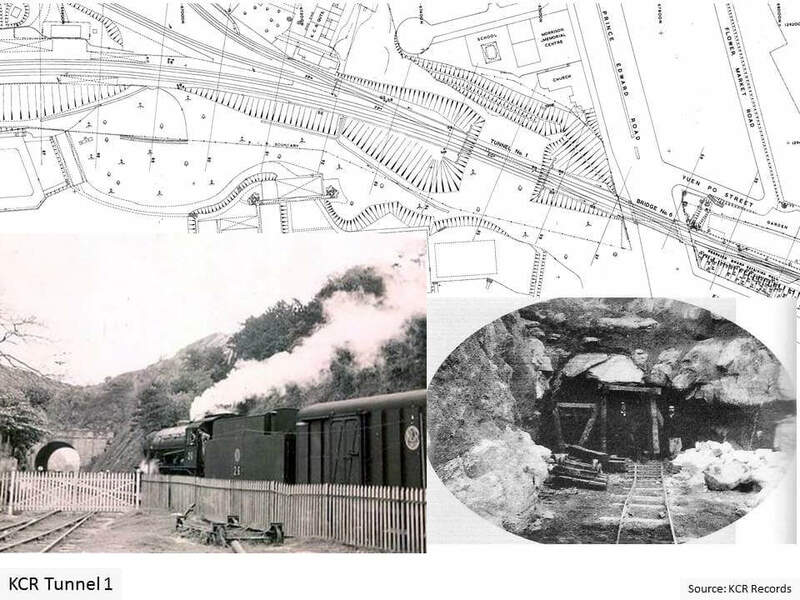 Tunnel 1 – a short tunnel (150ft or 45m long) located just to the north of Yaumati Station passing through an adjacent spur to Diocesan Boys School. The tunnel at 45m was the shortest to construct but by per metre, costed the most, with one explanation given at the time that it was due to the fact that the “Contractor took risks”, suggesting that there was a significant amount of additional work to recover from the short cuts! Tunnel 2 – Beacon Hill tunnel (7,212ft or 2,198m long) passing through the Kowloon hills. At the time of opening, the tunnel was the longest in China and the fifth longest in the world outside of Europe. Three shafts were constructed, one 91m from the south portal at 28m deep, one 15m deep close to the north portal, and the third at 81m deep located 396m from the north portal. The shafts were excavated to provide multiple excavation faces, thus speeding up construction. 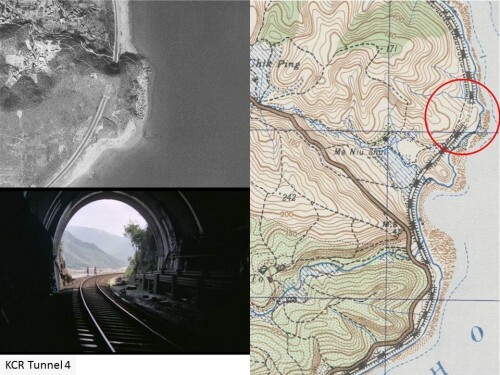 However, the shaft close to the northern portal was abandoned following a typhoon on the 26th September, 1906, and was then converted into cutting. At the top of each shaft was a winding house, driven by a steam engine. Road access to the portals had to be constructed along with metre-gauge line for the transport of materials. 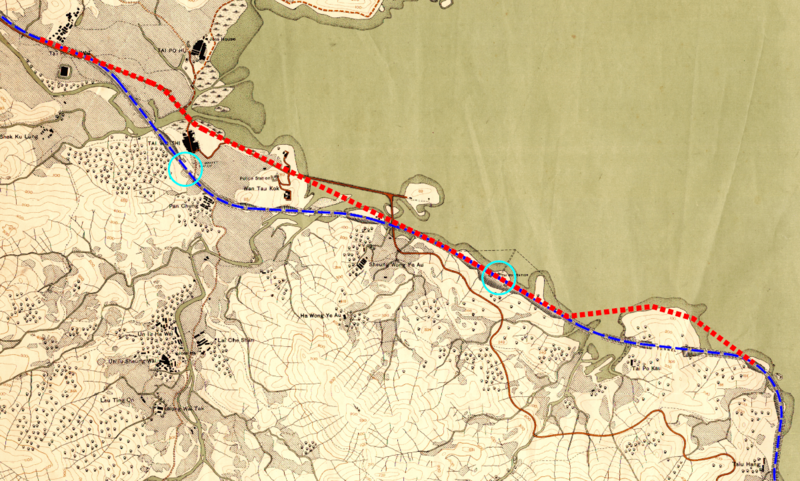 In the south, a 3.2km line was constructed to the nearest jetty and in the north a 2.4km line was constructed to the sea. The shafts were also to be used to provide ventilation to the operational tunnel, but the cost of providing a permanent lining was considered excessive, so in the end they were backfilled following completion of the tunnelling works. The tunnel was excavated predominantly through granite using blasting to remove the rock. At the portals, poor ground was encountered with resulting high water inflows of up to 45 l/s. The tunnel excavation was 6.8m high and 5.5m wide, requiring excavation to be undertaken in two stages. Firstly, a heading was constructed in the lower part of the tunnel, 2.6m high and 3.3m wide, followed by the remaining cross-section of the tunnel. Driving of the bottom heading commenced from the south portal and shaft in December, 1906, from the north portal in January, 1907 and from the north shaft in October, 1907. The bottom heading was completed on the 17th May, 1909 when the two sides accurately met at 1,027m from the south face. 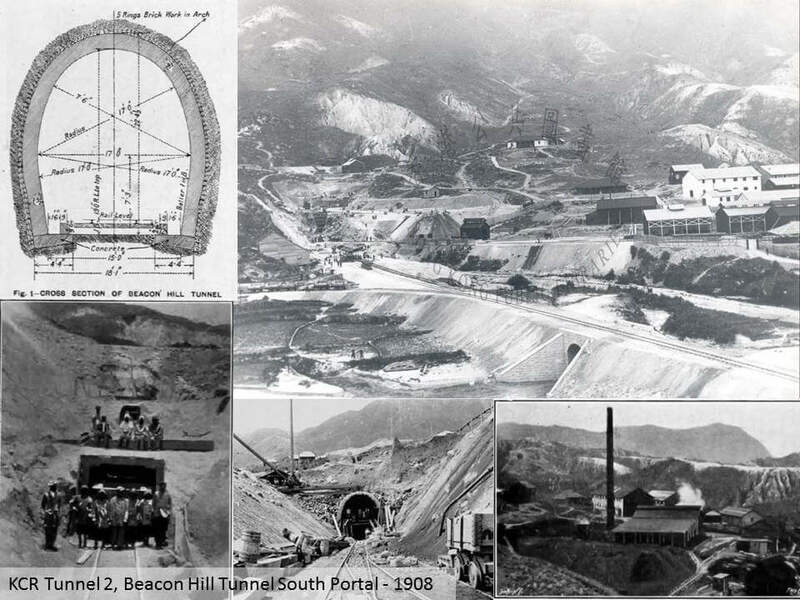 Excavation of the full tunnel section was undertaken by excavating upwards every 45m to the full tunnel size. This arrangement allowed for multiple works faces and removal of spoil by narrow gauge line and skips. After the 4.5m of full tunnel section had been excavated, the permanent brick lining was constructed. 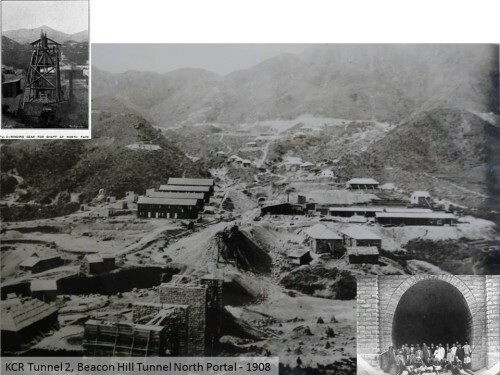 Lining of the tunnel was formally completed on the 16 February, 1910 when the Governor, Sir Frederick Lugard placed the last brick. In terms of production, the lower heading averaged 18m/week per face and the tunnel lining at 14m/week per gang. The final cost of the tunnel was HK$3,283,503, amounting to about one third of the cost of the entire line. 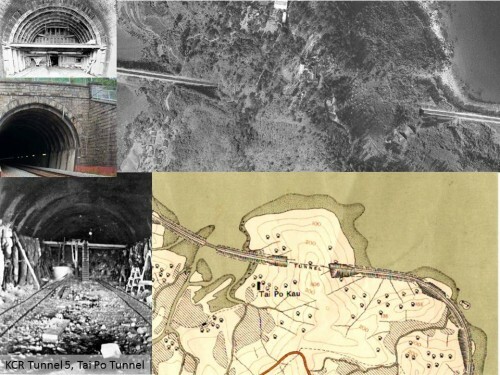 Tunnel 3 – a tunnel which passed through the hillside (329ft or 100m long) to the south of the current University Station, with the Tai Po Road passing above. Tunnel 4 – a short tunnel (170ft or 52m long) to the north of the current University Station, passing below the hillside. Tunnel 5 – Tai Po Tunnel (923ft or 281m long) passing below the headland on the approach to Tai Po Station. 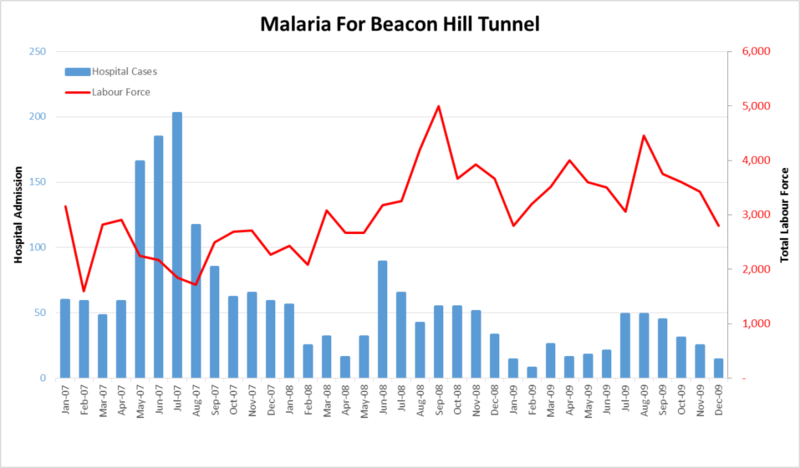 Construction of the tunnel was problematic with poor access, unstable hillside and high levels of malaria affecting the workers. 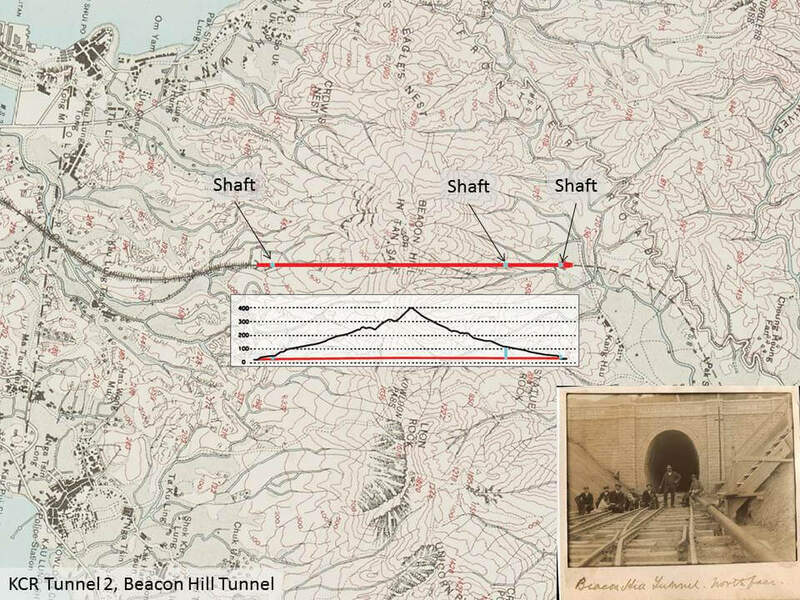 Unlike Beacon Hill Tunnel, the top heading was driven first, followed by the lower bench. The tunnel headings met on the 28th April, 1909. There were 19 bridges with spans of more than 12m, and of these, four were arches and completed for double track. Four were steel girders and completed for double track and four others were single track steel girders on double track abutments. Four of the bridges required the construction of 30 “well foundations” or hand dug caissons as they are called today. The most expensive bridge was bridge number 2, carrying Gascoigne Road over the railway. The bridge was at the junction of Gascoigne Road and Des Voeux Road, re-named to Chatham Road in 1908. The bridge was required to accommodate the 30m wide road as it crossed the railway, but given the skew arrangement, it required a 53m span bridge. Alternative arrangements that would narrow the span were rejected by the Government. A similar problem was experienced at bridge number 4, crossing Waterloo Road. The bridge had to be built on hand dug caissons with multiple spans, the largest being 24m across a road of only 5m width at the time. As noted in the 1913 paper, “Level crossings in all these places would have been quite sufficient for several years to come, there being no traffic except rickshaws and a few hand-carts draw by gangs of coolies”. For the bridges in the northern portion of the line, bull brick kilns were constructed near the line to fire the large construction bricks. The Government had banned the use of local firewood so coal was adopted, requiring coolies from India to be imported who had the experience with the process. 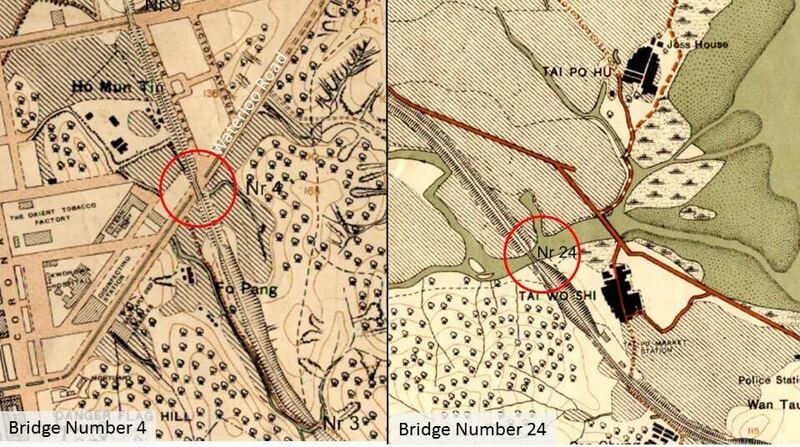 A particularly complex and multi-span bridge was bridge number 24 north of Tai Po spanning over the Lam Tsuen River. Ballast for the railway, the stones that support the sleepers, was broken down to size so it could pass through a 64mm ring using hand tools. To avoid the need to move large quantities of materials around, the ballast was crushed and stockpiled at short intervals along the line from the locally excavated material. The option to use a rock crusher was explored but the transportation issues made it un-economical. The rail was a 85lb flat-footed rail supplied in 10m lengths and laid on New South Wales hardwood sleepers at 600mm intervals. Installation of the track proved problematic due to the shortage of the necessary rolling stock usually employed for the task. The track and sleepers had to be taken by boat to Tai Po, where the materials were then laid out south to Beacon Hill and north to the Lo Wu using narrow gauge equipment. Once all the ballast works had been complete, the tracks were then spread to standard gauge of “4 feet 8½ inches”. At the peak of construction in 1908, over 5,000 labourers were employed on the works; theirs was a tough and dangerous life. The workers could spend all day “being knee-deep in water or soft mud and no doubt has been responsible factor in the incidence of sickness”. 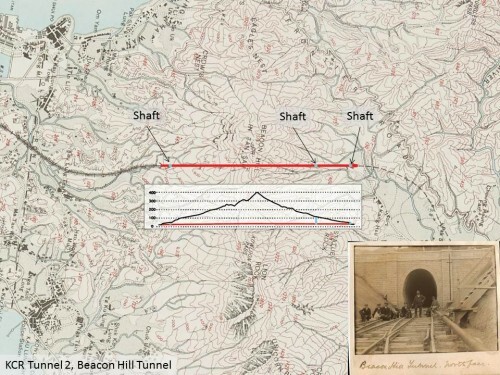 Local workers were suspicious of the tunnel environment and would not work on the Beacon Hill Tunnel. As reported in the paper to the Institution of Civil Engineers in 1913, “At first it was found very difficult to get the Chinese coolies to go underground, and Indians had to be imported to work the machine-drills. As soon as the Chinese coolies begun to return from South Africa the labour difficulties practically ceased. A European working miner, however, had to be always at the face. Up to within a month of the meeting of the headings three shifts of 8 hours each were worked, but at the end no coolie could stand more than 6 hours’ work at a time.”. Even when good labour was found, this was also transient, as reported in September, 1906, “most of the good coolies have left the works for the purpose of rice planting”. Coolies imported from northern China struggled with the humid summers, and had difficulties acclimatise to the Hong Kong environment. As reported in 1913, “Wash houses were provided for the tunnel coolies, but they could not be persuaded to use them.”. In November, 1906 G W Eves, reported he had imported 150 coolies from Tientsin, “but within a very short time as many as 36% were down with malarial fever at once.”. As soon as the conditions became known, no more northern labours could be persuaded to join the project. A dedicated medical team was established under the Railway Medical Officer, J W Hartley M.B. to look after the workers and maintain records. It became apparent early in to the construction that malaria was a major problem, particularly north of Beacon Hill Tunnel. Additional land was purchased around the works to allow land drains to installed, eradicate the pools and swamps that formed the mosquito breeding grounds. In addition, pools of water that could not be drained were treated with kerosene oil to prevent mosquito breeding. Along with frequent cleaning and disinfecting the labour quarters (mat sheds) there was a significant improvement in the working conditions and a 50% reduction in hospital cases. Quinine was also issued to provided resistance to malaria. However, it was discovered that much was being wasted or bartered in local shops for goods. As reported in the 1908 KCRC Annual Report, “the natives, especially when new to the territory not taken kindly to the drug, and it has often to be given under compulsion”. This practice of forced medication and the wastage was stamped out. Three dispensaries were established; in Kowloon, Shatin and at Tai Po Kau with experienced medical personnel operating day and night. With the availability of Western treatments, the neighboring villages would bring their sick children for treatment. There were many fatalities on the job, including men killed from misfires of the dynamite, over-come by blasting fumes and murder. However, the biggest killer was from disease. A summary breakdown of the costs by work element is shown below; HK$. There was an additional cost of $72,008 for the Fanling Branch Line. The major cost increase related to the cost of land, and the additional land required for Kowloon Station. The cost under the heading for plant included all the construction plant, tools and workshops for the line along with the locomotives, carriages and wagons. The cost of construction plant was lower than the original estimate with all the growth in cost taken up in the needs of the operational equipment. The ‘General’ costs heading captured the staff salaries that rose from $309,724 to $439,959, but the major increase was on interests on loans, value of stores and a loss on exchange funds. Thus, from an original estimate of $5,053,274 the costs more than doubled to $12,224,921, at the time of opening, making the line one of the most expensive railways at that time. This article was first posted on 30th November 2015.